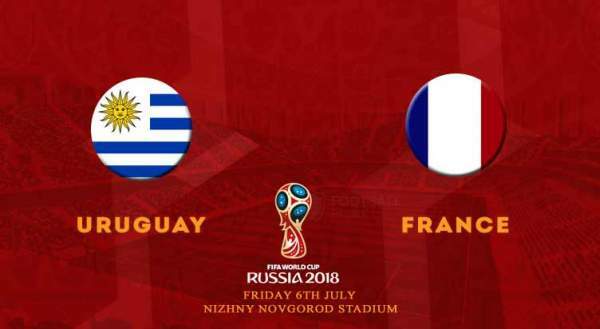 Uruguay vs France is the next match in the FIFA World Cup 2018 quarterfinal stage being played in Russia. If French happens to win today, then it will become the first team to qualify for the semifinal round of the tournament. France has reached this point after beating Argentina by 4-3 in the Round of 16. The French side has been its group winner. On the other hand, Uruguay is also the group winner after beating Portugal by 2-1 and conceding its first goal of the tournament. France looks healthy but there is one concern as to how it will be in attack. Let’s how will it handle the towering against Uruguay. And concern for Uruguay is that whether Edinson Cavani will be able to play today or not. The star striker wasn’t able to play in the match against Portugal due to a calf injury. His status is still unknown and doubtful. The 2018 FIFA WC is down to eight teams and we have two important matches today, this Friday. We could see him replaced with Cristhian Stuani or Maxi Gomez, or maybe a more defensive lineup would be seen to counter the quickness of France in the middle pitch. Without Cavani, the South Americans would be at a huge loss. He provides the Euro 2016 runner-up a boost in their chance of moving ahead in the tournament. Now, let’s move on to how you can watch the match and get the latest & live updates. This match will be followed by Brazil vs Belgium today only. All the eight teams in the quarterfinal stage are capable of winning the cup. The final match will be played on July 15, 2018, at the Luzhniki Stadium in Moscow. France has got serious winning momentum after defeating Argentina by putting up a fine attack. However, the French side need not show overconfidence as the defense of Uruguay is a serious matter. It’s a difficult part to predict who could be the winner. France 2, Uruguay 1.